Derek Bishop was very wealthy, and as his daughter Kate found out at least somewhat shady so she distanced herself from him. But this didn't stop her from using his money to finance the Young Avengers. In Hawkeye Annual (2013) #1 he cut her of from his wealth so she came to LA to earn money as a Hero/PI For Hire. 1 of her investigations lead her to a scheme by Madame Masque to sell rich people extended life by uploading their consciousnesses to LMDs. 1 of Masque's clients was Derek Bishop, but I don't think he's actually been LMDed. But now he's working with MM again. The Temple Of The Shifting Sun will be the opposition for the next 3-parter. The West Coast Avengers have been captured in an abandoned funfair by Madame Masque and her gang, except Hawkeye (Kate Bishop) who escaped with help from 1 of the gang, her supposedly-dead mother Eleanor. But Kate went back in to rescue her teammates and was attacked by her ex-boyfriend Marvel Boy (Noh-Varr). Now Noh-Varr explains that he's infiltrated the gang pretending to be the villain Graviton for reasons unrelated to the WCA. Which is why he had to attack her. But now he'll help her in the rescue. Having defeated MODOK's sharks last issue the rest of the team are now facing a giant hellfire monster created and controlled by Satana. Hawkeye (Clint Barton) and America Chavez are still trapped in suspended cages while Kid Omega, Gwenpool and Fuse (Johnny Watts) are on the ground with non-combatant Ramone Watts, Johnny's sister and America's girlfriend. Quentin Quire is still groggy from expelling the sharks, and Gwen Poole no longer has her 'superpowers' (since the beginning of this series). So Fuse has his body in a vibranium state hoping that will be enough. But the monster swats him and Ramone aside. Satana, MODOK and Madame Masque watch from a control room with Eel and Lady Bullseye. Masque reminds Satana she doesn't want them dead, just scared out of Los Angeles. Dead superheroes only bring more superheroes for revenge. Satana promises only to maim them. The hellfire monster prepares to slam its fists down on the stunned pair when Kid Omega recovers enough to shield them with his telekinesis. Clint sees Kate in the wings using sign language to tell him to remove his hearing aid. (Barton suffers from hearing loss due to an attack by the Clown in Hawkeye (2012) #15.) When he does so he immediately feels better. Kate-Hawkeye then launches a batch of sonic arrows which cause ear-pain to the others apart from Clint. But America is the 1st to realise that she now has her powers back, and deduces (correctly) that the baddies have been using high-frequency sound to suppress them. Kate's arrows have temporarily made them deaf to high frequencies. 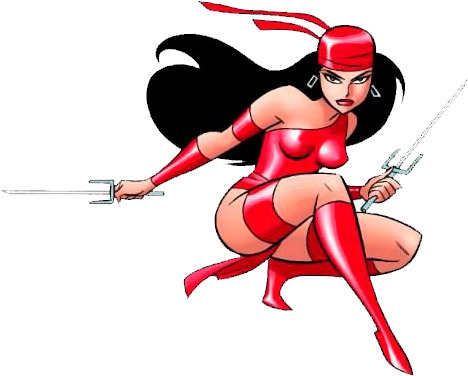 Kate uses another arrow to deliver Clint-Hawkeye's bow and arrows to his cage, while superstrong America just kicks her way out of hers. But she finds that something is still stopping her from holding a portal open long enough to get unconscious Ramone to hospital. If it closes while they're passing through it would cut them in half. The bad guys get ready to flee, and Graviton joins them. But MODOK mentally detects he's not the real deal (even though it appears Noh-Varr's been carrying on the masquerade for a while). So Noh drops his disguise, apologises for deceiving them but then punches Madame Masque in the mask. Kid Omega encases Ramone in a protective TK bubble (after surlily complaining about it to keep up his bad boy image). Clint tells him to stay here to keep her safe, and Fuse to stay to keep them both safer. America flies Gwenpool up to the control booth with Clint following via a rope-line arrow. As they get there an explosion blows the glass out, and inside they find Marvel Boy fighting everyone. Madame Masque tries to slip away but Kate is waiting for her. But then Eleanor Bishop knocks her daughter out from behind. MODOK teleports the villains away leaving hellfire wolves to harass the heroes. Gwenpool retrieves her katanas and she finds they can shred hellfire when she dives back to the ground to join her boyfriend Quentin. The others in the control booth aren't faring so well against the wolves until America has an idea. She tells Clint and Noh-Varr (carrying unconscious Kate) to get off the floor. Then she creates a portal which the wolves fall through. It closes almost immediately, bisecting them. There is only 1 hellfire wolf left but she throws it at the power source for the villains' trap. It explodes and they all get their powers completely back. The team regroup on the ground. 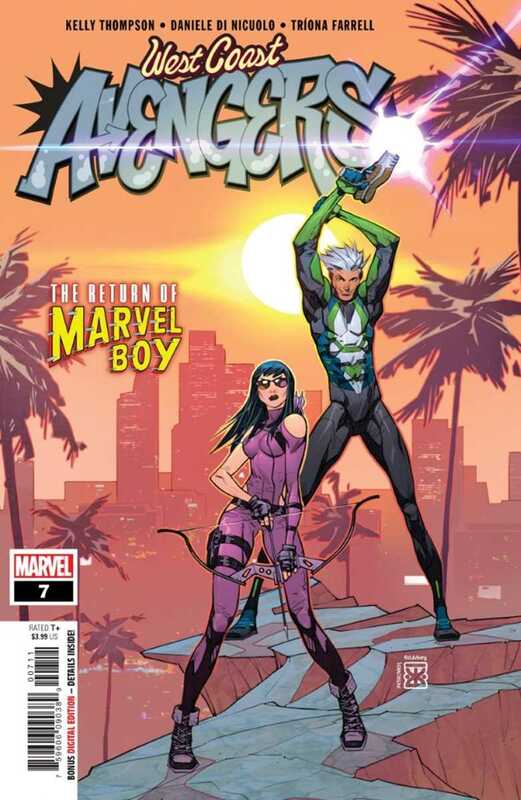 America introduces Noh-Varr to the others (she was with him and Kate in the Young Avengers). Fuse isn't happy because he knows that name - this handsome dude is his girlfriend Kate's ex. Gwen persuades the others to reluctantly let her adopt a baby landshark which she's found and named Jeff. (The landsharks were created by MODOK posing as BRODOK in the 1st story arc.). Kid Omega's unhappy because he didn't get to smash and villains. Clint opines that the villains running away proves they're scared of the team. America gives them a portal back to base. She's carrying Ramone, Fuse has Kate and Gwen has the shark. Marvel Boy now informs them that he needs their help to save the world. But Kate says they all need some R&R, and Noh admits that the world won't end *tonight*. Noh accepts it and asks if he can sleep with her tonight. She just points to a couch. America walks Ramone home and they share a kiss. Back to the baddies who are definitely *not* happy, and squabbling among themselves. The real Graviton is with them. As is Eleanor Bishop wearing an MM-style mask. Madame Masque herself tells her team, which she calls the West Coast Masters Of Evil, to shut up. Next time they *will* destroy the WCA. And joining them is Kate's father Derek Bishop. Editor: Alanna Smith. Editor-in-chief: C. B. Cebulski. Plus: Derek Bishop, Eel (Edward Lavell), Eleanor Bishop, Fuse, Graviton, Gwenpool (Gwen Poole), Hawkeye (Kate Bishop), Kid Omega, Lady Bullseye, Marvel Boy, Ms. America (America Chavez), Satana.